Our 3.4" X 5.8" laminated pocket medical cards fit perfectly in a scrubs or lab coat pocket and provide the most important information on specific topics in a clear and concise manner. These practical, sturdy, easy-to-read reference cards are a must for the medical professional or interested lay person. 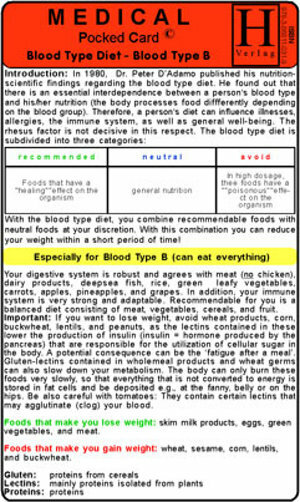 The Blood Type Diet - Blood Type B card provides an introduction to the special nutritional needs of individuals with this blood type as well as a food table divided into the categories of recommended, neutral and foods to be avoided for these individuals.